Dedicated to spreading their repertoire, Transient Canvas maintains an active touring schedule. They have been presented by the Alba Music Festival (Alba, Italy), Music on the Edge (Pittsburgh, PA), Composers, Inc. (San Francisco, CA), SoundNOW Festival (Atlanta, GA), Music at the Forefront (Bowling Green, OH), Outpost Concert Series (Los Angeles, CA), Moore Hall Recital Series (Pembroke, NC), New Music at the Short North Stage (Columbus, OH), Music on Madison (Evanston, IL), New Music Nights at Spectrum (New York, NY), Classic City New Music Festival (Athens, GA), Clocks in Motion (Madison, WI), the Corwin Chair Concert Series (Santa Barbara, CA), First Fridays (Providence, RI), New Hampshire Music Festival (Plymouth, NH), Re:Sound (Cleveland, OH), the New York City Electroacoustic Music Festival (New York, NY), and the Guerrilla Composers Guild (San Francisco, CA). They have performed and presented at several professional conferences including PASIC, SEAMUS, SCI Region 1, and two New Music Gatherings. In Boston, they have been featured on the Equilibrium, Original Gravity, Opensound, New Gallery, Lowell Lecture, and Times Two concert series. Equally dedicated to educating the next generation of performers and composers, Transient Canvas has presented masterclasses and composition workshops at Baldwin Wallace, Cleveland State, Franklin Pierce, Fresno Pacific, James Madison, Kennesaw State, Kent State, Northern Illinois, Ohio Wesleyan, Otterbein, Rutgers, and San Jose State Universities, UC Berkeley, UC Riverside, University of Maine, UNC Pembroke, University of the Pacific, UW Green Bay, and UW Madison. They have also held residencies with the composition departments at Harvard, Northeastern, Brandeis, and Tufts Universities, the University of Georgia, the Vermont College of Fine Arts, the Boston Conservatory at Berklee, and the Alba Music Festival Composition Program. Transient Canvas proudly endorses Henri Selmer Paris clarinets and Marimba One marimbas and mallets. For more information, visit www.transientcanvas.com. 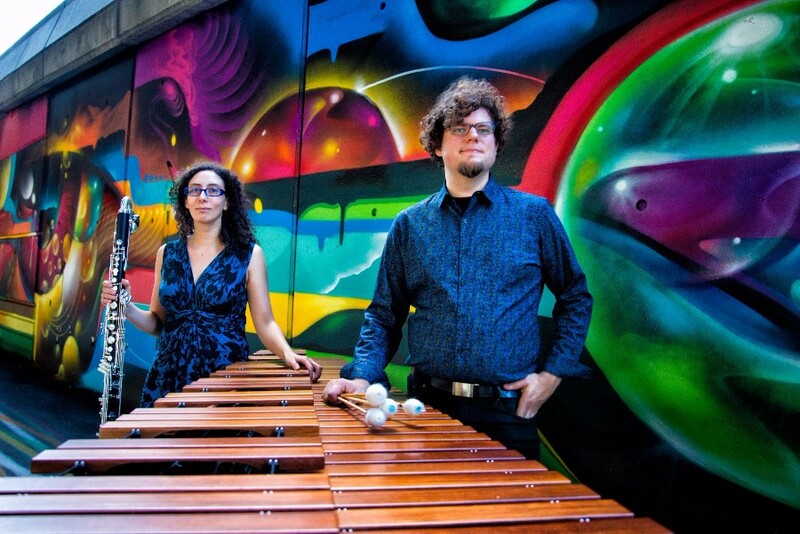 Praised by the Boston Globe as "superb", Amy Advocat and Matt Sharrock have been blazing their own trail as the bass clarinet/marimba duo Transient Canvas since 2011. In that time they have premiered over 80 pieces and continue to perform across the United States and abroad. They have been presented by the Alba Music Festival (Alba, Italy), Music at the Forefront (Bowling Green, OH), Composers, Inc. (San Francisco, CA), New Music at the Short North Stage (Columbus, OH), and Music on the Edge (Pittsburgh, PA), among others. Additionally, they have held residencies with the composition departments at Harvard, Northeastern, Brandeis, Otterbein, and Tufts Universities, the University of Georgia, the Vermont College of Fine Arts, and the Boston Conservatory at Berklee. They have two albums, Sift and Wired, both released on New Focus Recordings. Transient Canvas proudly endorses Henri Selmer Paris and Marimba One.For more information, visit www.transientcanvas.com. Hailed as “dazzling” by the Boston Globe, Dr. Amy Advocat, clarinetist, is an avid performer of new music having performed with Guerilla Opera, Boston Modern Orchestra Project, [sound icon], Firebird Ensemble, Callithumpian Consort, The New Fromm Players at Tanglewood, Boston Microtonal Society’s NotaRiotous, Glass Farm Ensemble, and the Second Instrumental Unit. Ms. Advocat is a founding member of the bass clarinet and marimba duo, Transient Canvas, with whom she has commissioned and premiered over 75 new works, including pieces by Marti Epstein, Curtis Hughes, and Osnat Netzer. Their recording of Andy Vores’ Fabrication 10: Itch appears on his latest CD One Head, released in January 2013. Always looking for the most innovative projects, Ms. Advocat was recently highlighted in the Boston Globe for her work at the Bohlen-Pierce Symposium in Boston, during which she premiered six pieces on the newly invented Bohlen-Pierce clarinet. This instrument plays in a non-octave-repeating tuning system which offers an alternative to our own, and was the basis of Ms. Advocat’s studies toward her DMA at McGill University in Montréal. Equally at home with more traditional classical music, Amy Advocat has also performed with Odyssey Opera, Boston Pops, Harrisburg Symphony, Opera Boston, National Lyric Opera, Boston Philharmonic and the Virginia Symphony Orchestra. Ms. Advocat was twice a fellow at the Tanglewood Music Center, and has participated at the Spoleto USA Festival, New Hampshire Music Festival, Monadnock Music, Summer Institute for Contemporary Performance Practice (SICPP), New York String Orchestra Seminar, Virginia Arts Festival, and the American Institute of Musical Studies in Graz, Austria. An advocate for new music, Matt currently serves as Music Director and conductor for the Equilibrium Ensemble, a new music sinfonietta dedicated to promoting the work of New England-based composers, and he is the resident percussionist with Ensemble / Parallax, a multimedia consort dedicated to the music of the European avant-garde. He has performed with many of Boston's premier chamber groups, including the Chameleon Arts Ensemble, Sound Icon, Boston Musica Viva, Alea III, the Lydian String Quartet, and the Lorelei Ensemble. Matt has recorded as a soloist, conductor, chamber musician, and orchestra musician on BMOP/sound, Innova, Navona, New Focus Recordings, and Ravello Records.